Scope and Content Clachnaharry Sea Lock, Caledonian Canal, Inverness, Highland This lock was built as part of the Caledonian Canal, designed by Thomas Telford, which runs from Clachnaharry to Corpach, through the Great Glen. It was opened in 1822. It was built in an artificial embankment made by tipping earth on to the bed of the Beauly Firth to reach deep water. 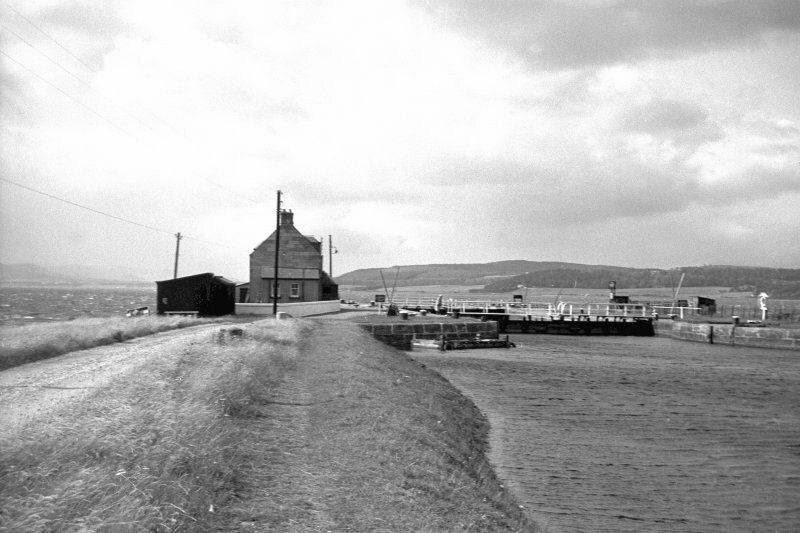 This shows the lock from the south-east, looking along the artificial embankment towards the Beauly Firth. The building on the left is the lock-keeper's house. In 1965, when this photograph was taken, the lock had recently been converted from manual to hydraulic operation. The canal was at that time mainly used by fishing boats moving to and from west coast fishing grounds. It is now popular with European yachtsmen. Source: RCAHMS contribution to SCRAN.